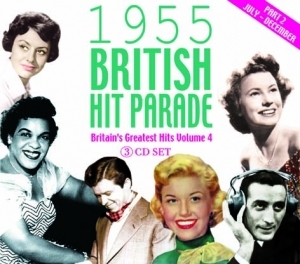 The fourth volume in Acrobat?s ongoing series devoted to the British hit parades. In 1955 the chart increased to 20 places which has meant that it now takes six compact discs to feature all of the years chart entries. We have there fore split volume four into two 3 CD sets. This second 3CD set comprises every record that entered the UK chart from July 16th 1955 to December 24th 1955 in chronological order of entry with the exception of multiple versions of the same song where we have separated the different versions for ease of listening. The beginning of the year can be found on ACTRCD 9008. The first three volumes (1952, 1953 and 1954) have been Acrobats biggest successes and marketing and promotional activities will reflect that. 4 Something's Gotta Give Sammy Davis Jr..
16 Love Me Or Leave Me Sammy Davis Jr.
22 That Old Black Magic Sammy Davis Jr.
13 Hey There Sammy Davis Jr.